In 1973 I left Melbourne Australia for London desperate for more than ten orchestral concerts a year and a month of opera. 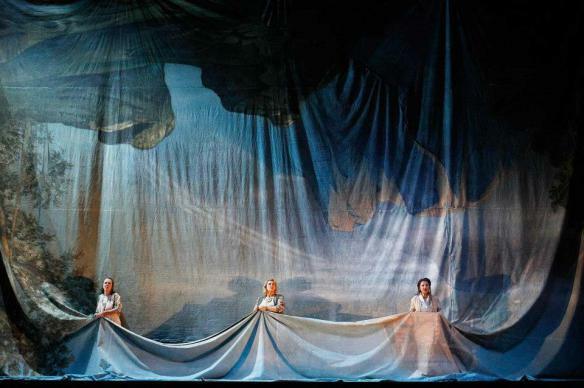 In the midst of the eight week Prom season of nightly concerts in 1973 I had to sacrifice four of them to attend my first Ring Cycle at the English National Opera in London. 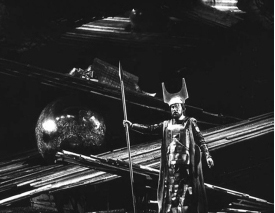 Reginald Goodall conducted Australian Rita Hunter as Brunnhilde and Alberto Remedios from Liverpool as Siegfried. As it was my first it was exciting and magnificent. 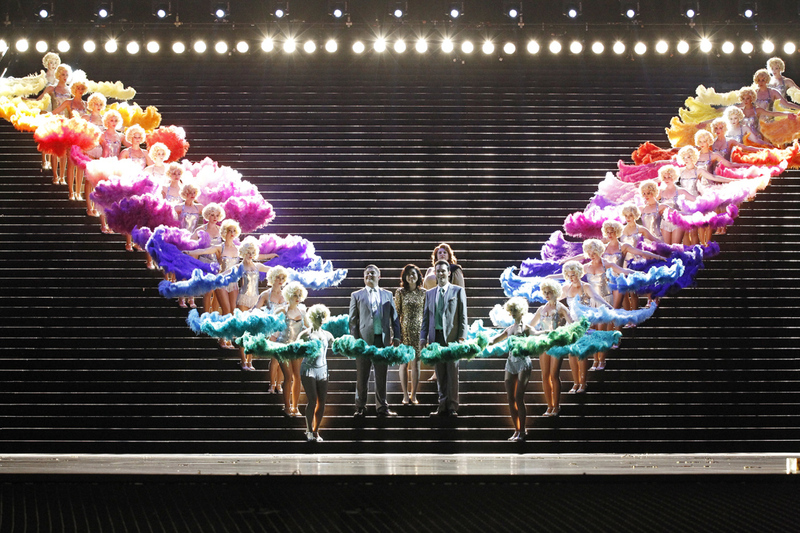 Although a modern style production its imagery was visually satisfying and no guess work was needed to understand what was happening on stage. 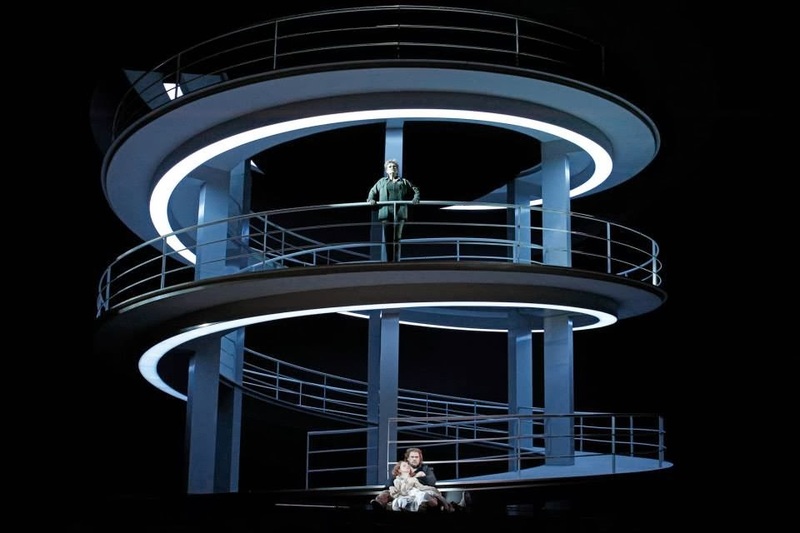 Unfortunately the Ring in Melbourne late 2013 was the complete opposite with few visuals making sense or giving pleasure. Many were so distracting it was difficult to concentrate on the music. 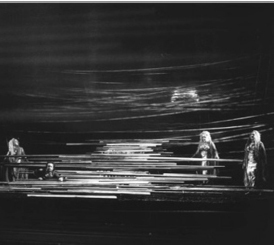 The Rhine was massive thick blue ropes draped over the proscenium. Later the idea continued in the background. The rainbow bridge was made up of the large horizontal metallic poles as Valhalla with the eventually various colours reflected on them. 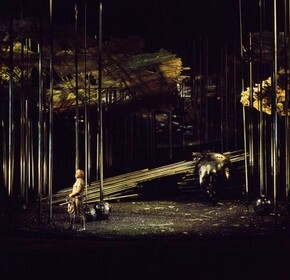 Vertical poles now for the forest with Fafner as the dragon lurking in the background. I only recently realised that I had no visualisation abilities. All the wonderful descriptive prose of Hardy and Dickens I appreciated as clever and precise brought no image to my mind. I guess this was the reason movies were important for me as the image was there for me to see. Therefore I needed my visuals. More importantly the visuals be part of the story line. 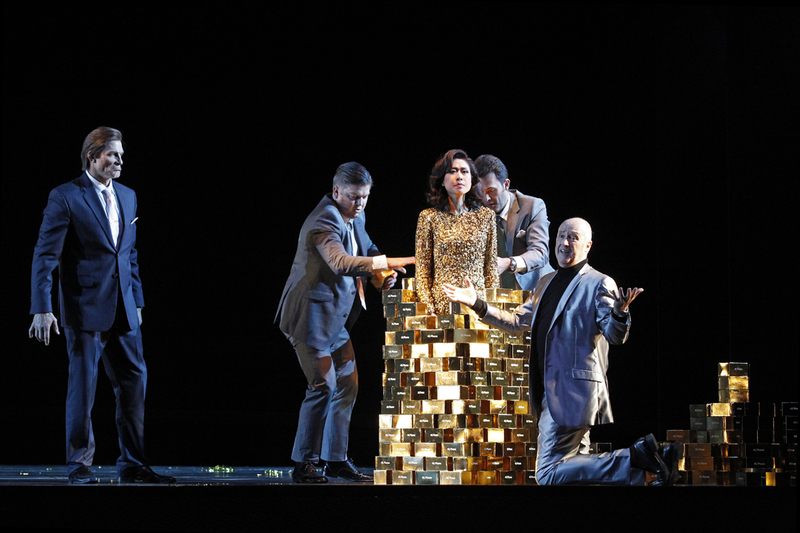 The ENO Ring did not have the solid imagery but it had acceptable impressions of the real thing. This was the lacking magic of Melbourne. 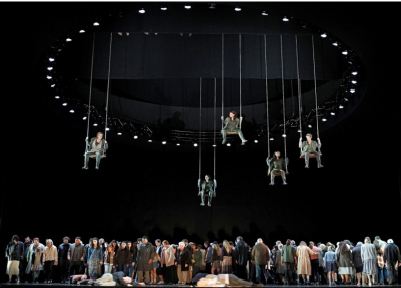 In the above photo of the Melbourne Ring Cycle we see the towering battlefield. In this photo we see Valhalla filled with all the trivia that money can buy. 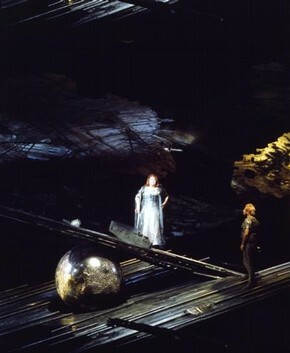 What is worse poor Brunhilde after singing a long aria has to run from the ground floor all the way to the top and out of sight (see above photo). Athletic she may be but she certainly doesnt look like a Valkyrie. Now the arrival of the giants was spectacular. 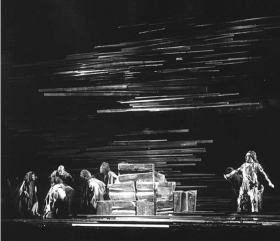 There was a full drape at the back of the stage which they dramatically tear asunder as the make their entry on fork lift trucks. 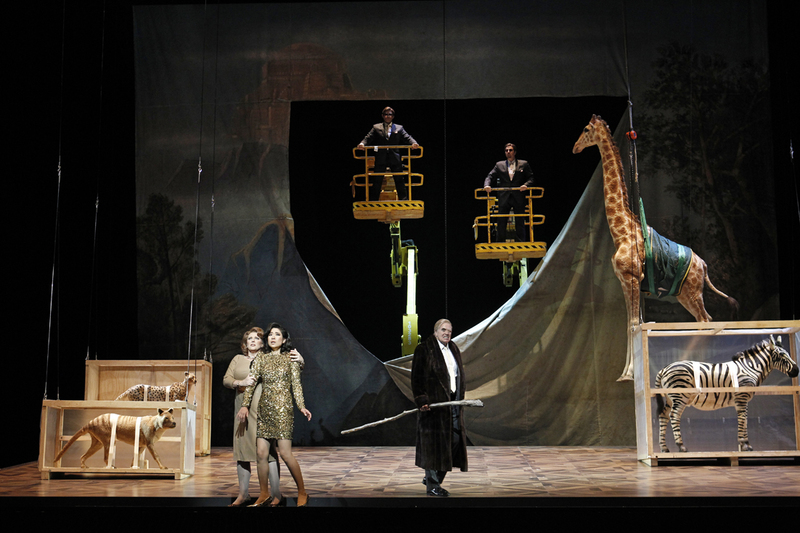 Wotan has already started on his menagerie. 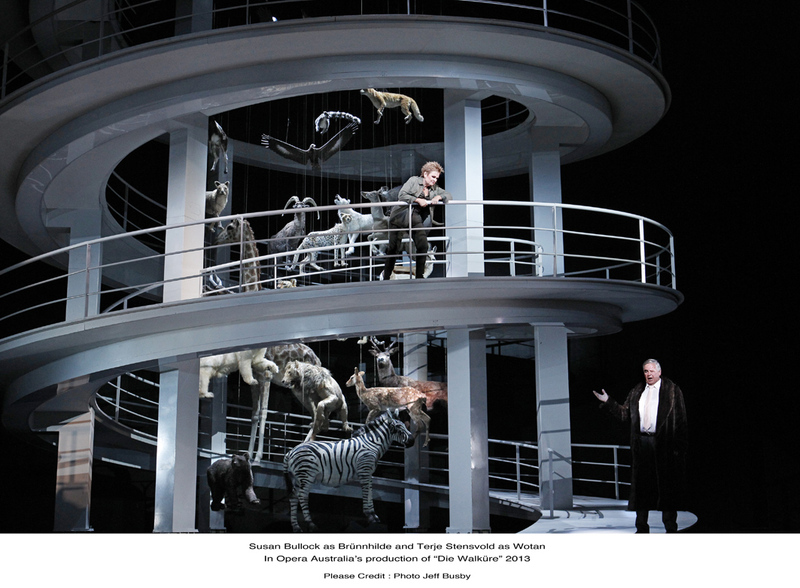 My Melbourne friends were excited about the production as it would be the first time to see how big the theatre stage was. 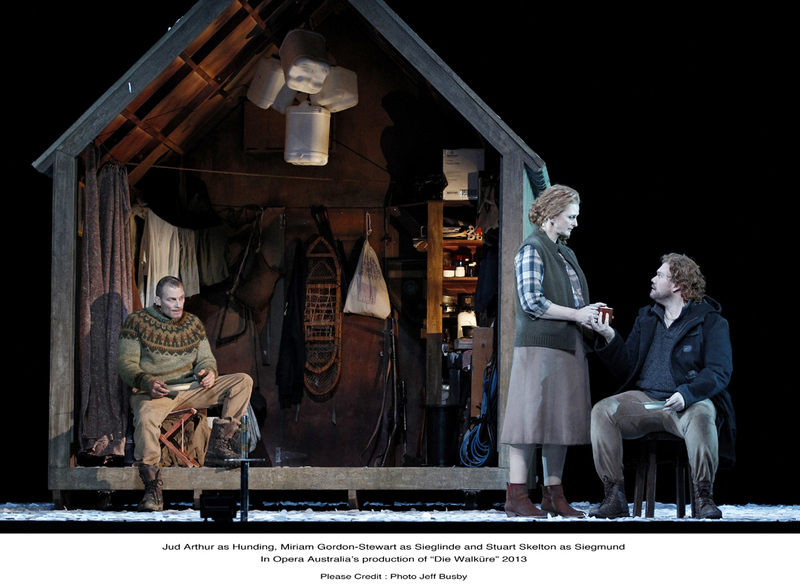 Imagine then the shock of Hundings hut  so small they had to drink outside in the snow (see next photo and diagram). The hut was dwarfed by the stage and certainly no room for an ash tree growing through it. Both the above scenes (Hunding's hut and Valkyrie rock) are surrounded by pure black flat floor, and black walls with no scenery whatsoever. 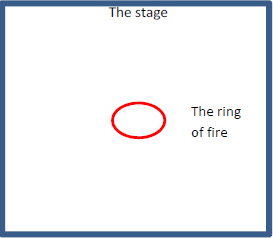 Remember the hut is in a forest and the fire occurs on the flat Valkyrie Rock. 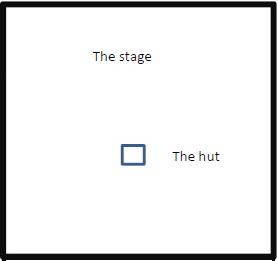 The above two diagrams show the poor use of the stage area. If you are going to have real fire, then do it with style that a hero cant overcome easily (as the next two photos of other world productions show). 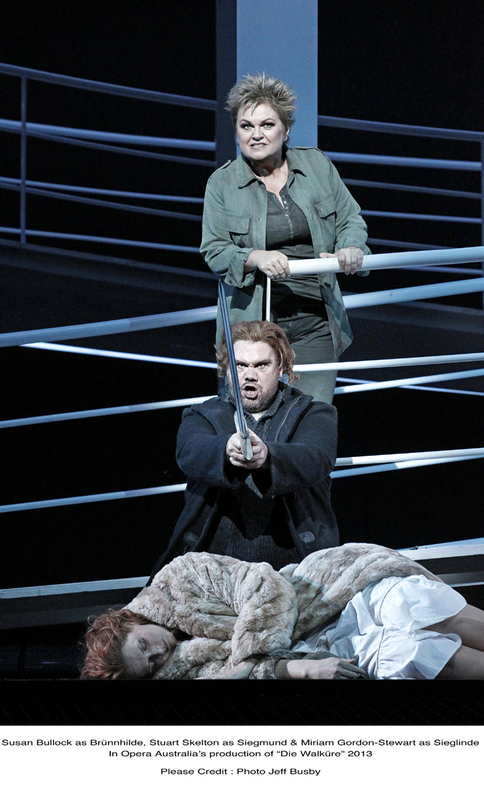 The slaying of Fafner the dragon is equally poorly handled in the 2013 Cycle. Both the forest and the slaying of Fafner can be seen by the audience (ENO, 1973). 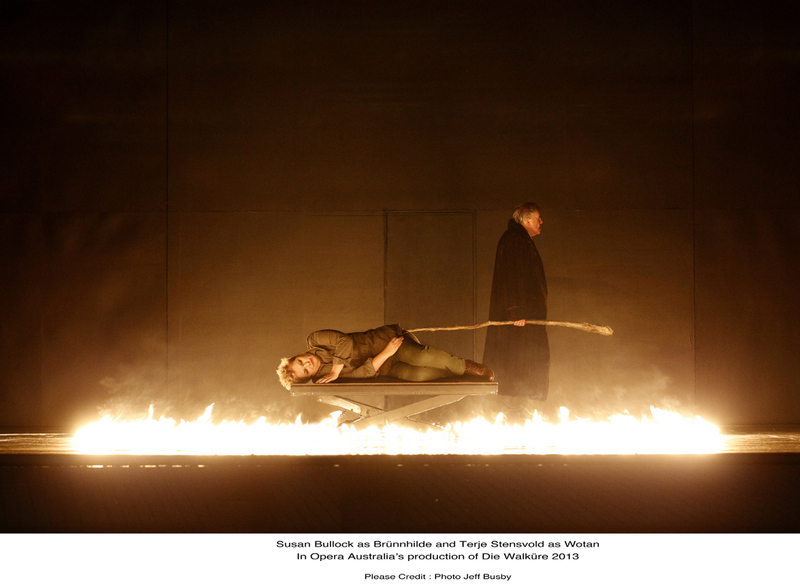 We only see the outside of the dragon's lair (Melbourne Ring Cycle 2013). There is no forest, there is no dramatic slaying (red streamers shot out from a gun don't count!) and strangely the dragon reverts to his naked human form. The Rope of Destiny scene was interestingly done. Instead of spinning, the norns were repairing the damage done by the giants Fasolt and Fafner as we have previously seen above. The ride of the Valkyries with its exciting energetic theme is always difficult to pull off. I appreciated the effort to have them flying (see next photo)  but on stiff unmoveable swings with them hanging on for dear life. The stiffness didnt go with the energetic music. 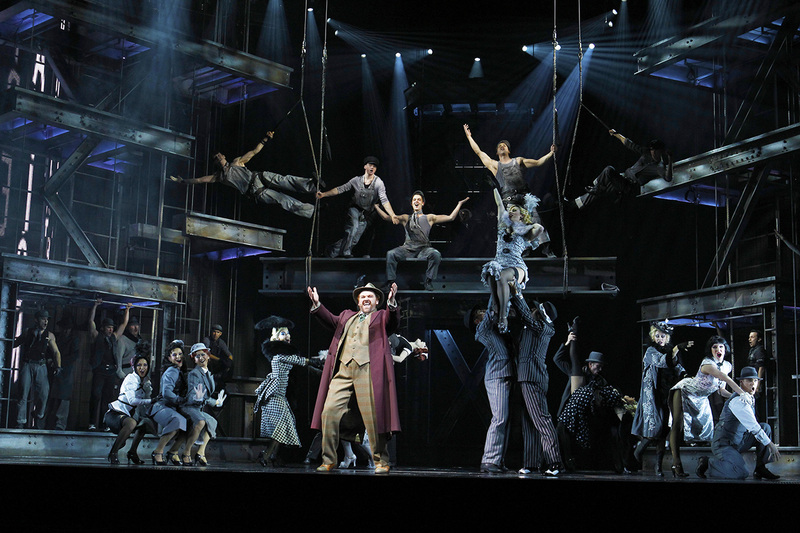 Imagine my amazement at seeing the Melbourne premiere production of King Kong the Musical with its similar Valkyrie-like scene with men descending on iron girders (see next photo). 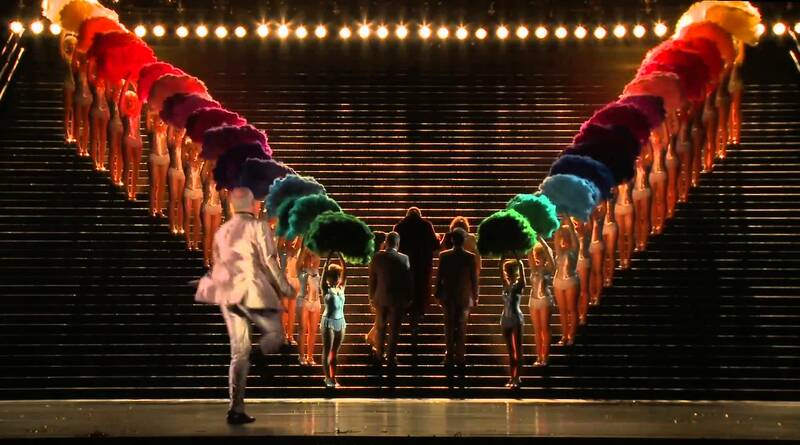 This part of King Kong was absolutely stunning. 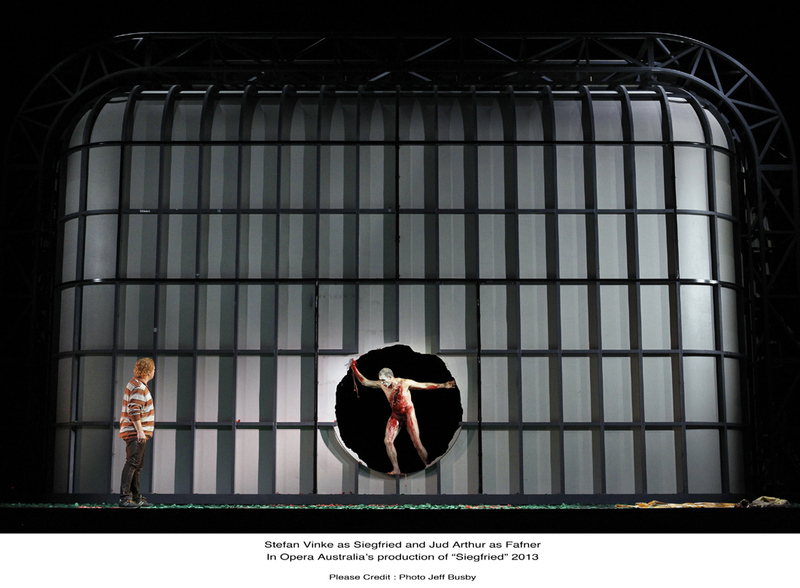 This experience occurred in between seeing the second opera (Valkyrie) and third opera (Siegfried) of the Melbourne Ring Cycle. 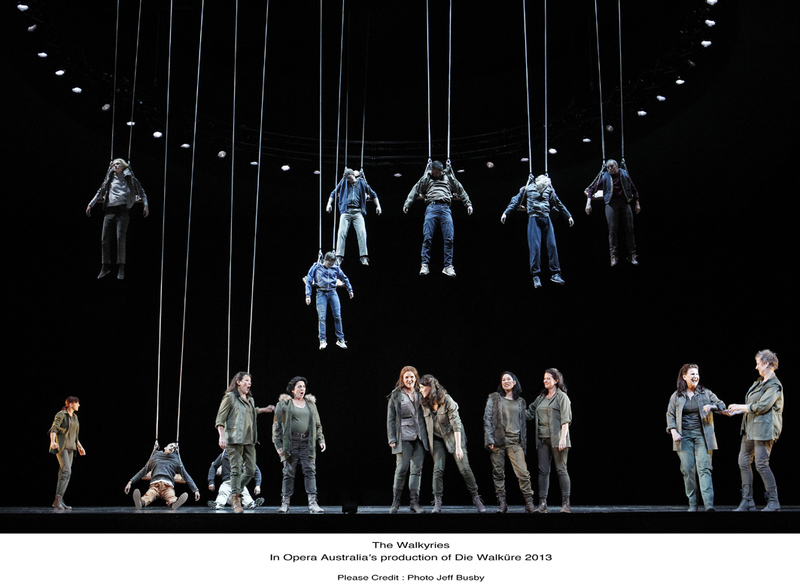 However, the Melbourne production of the RIng cycle I believe for the first time ever dramatically depicted the slain warriors being airlifted to Valhalla. 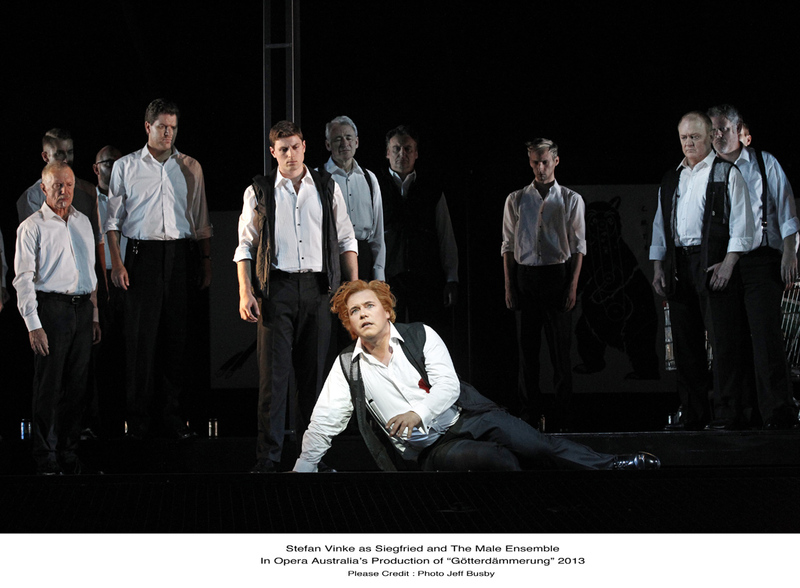 ... then after white washing his face, he is made to stand still for the last half hour of the opera. 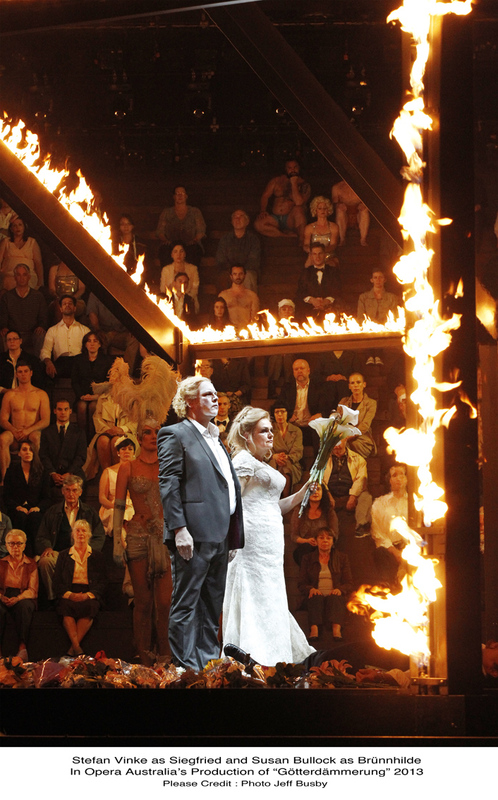 Brunhilde is made to stand beside him for ten minutes or so without riding into the flames. 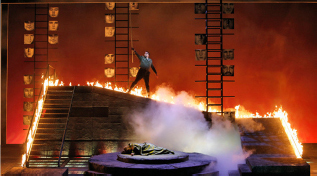 Now, there were some exciting creative visions but they didnt match up with what Wagner described in the music. Unfortunately too many of the scenes didnt really match up with anything. 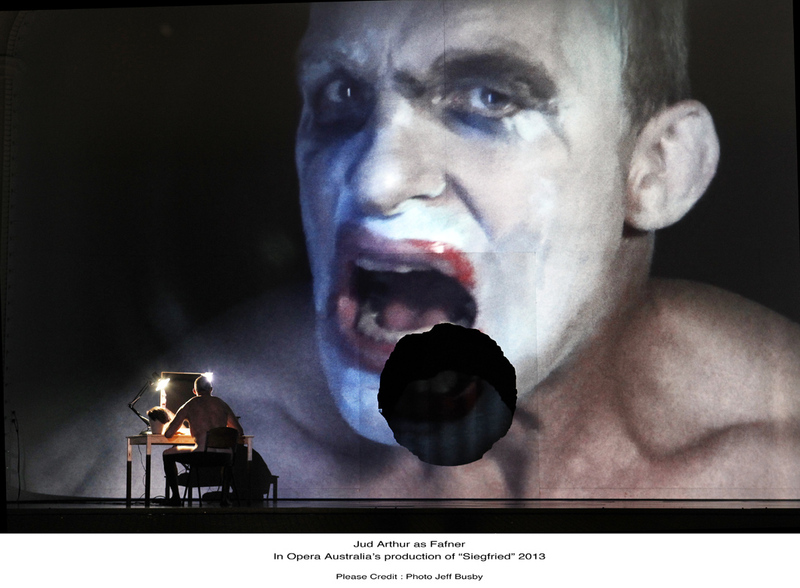 We see Fafner in his human form putting on his dragon makeup while a huge video of the scene is projected onto the front of what is to become the lair (see above photo). The gold ingots of Rhinegold treasure are the gold boxes for Ipads which can't be seen past the first five rows. If a political or environmental statement is to be made, then it should be immediately clear to the audience. As previously seen, concentrating on hanging stuffed animals just detracts from the drama on stage. The above review was written by Duncan McFarland.